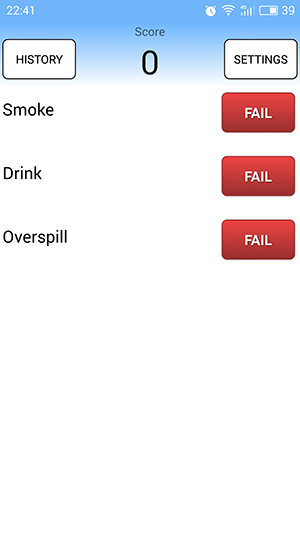 This application will help you get rid of bad habits , which make the quality of your life worse. The essence of the application based on the famous "point" method. Fit into the bad habits the application settings (you can choose more than one) that you want to quit and mark each stall in the program. Then follow the points for a total score of all habits. The technique is based on honesty to oneself. For this to work, you must realize that there is a bad habit and you really want to get rid of it. For each habit you need to set the level of severity: weak, medium, hard. It determines the number of seizures at failure points. For each day, for each habit 1 point, if no breakdown. Statistics are kept, recorded date / time of each breakdown and results account every 7 days and plotted. Success is considered, if the graph points each time increasing. If it falls or stands still - you should reconsider their behavior. Under addictions meant everything that you want to quit: smoking, drinking alcohol, drugs, wake up late in the morning, go to bed late at night, foul language, watching something forbidden, etc. The application does not function good habits deliberately - can not compensate for the bad good deeds. The first time you run the application you will see a blank home screen. On it will be only two buttons and a zero score. Click the "Settings" button. It will be possible to make a list of bad habits. It is necessary to fill from 1 to 7 points, in its sole discretion. Lightweight (3) - with the "failure" will be deducted three points from the general account. Average (-5) - when "failure" will be deducted five points from the general account. 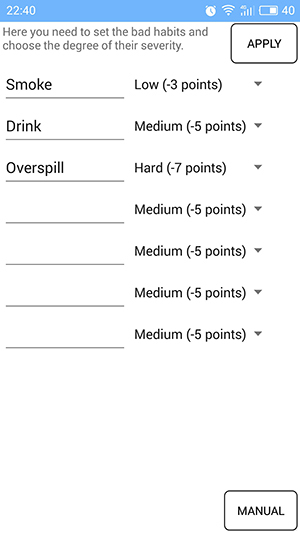 Hard (-7) - when "failure" will be deducted seven points out of a total account. On the return to the main screen you will see the list of added bad habits. Since then, the application begins its work. For example, if you broke down and used the bad habit, you need to open the app and click "Disruption" button. So you need to do every time. When you press the number of points will be reduced. The lower the score, the less success in getting rid of bad habits. After one day, if you do not press the "Disruption", then for each habit added one score. Total: If the refusal of bad habits is successful, then the total score of points increases, and you will achieve success. If the total score is in the same place for a long period, it is necessary to reflect and to change something in their behavior. If the total score falls or goes negative, you should urgently reconsider their behavior. 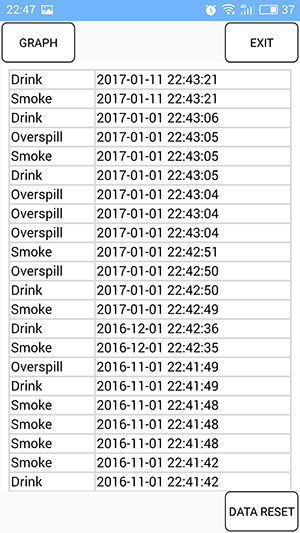 In has a log that records all failures with date and time. To access it you must press the button on the main screen the "History". 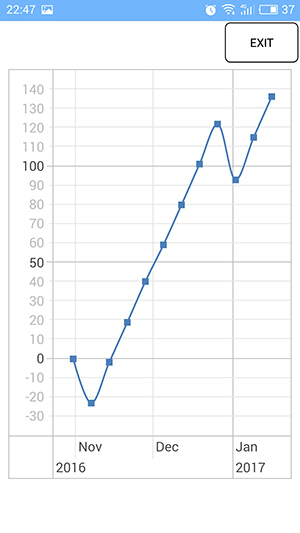 Every week (7 days), the total score is recorded, according to which in the future is plotted. You can analyze the success or failure With this schedule. To open the schedule must be on history screen click the "Schedule". The developer wishes you every success in achieving its objectives. Man - this is a rational creature, which is able to control his behavior.